Everyone you meet has goals. They talk all excitedly about how they're going to become a millionaire before they turn 40, how their kids are all destined for Ivy League schools, and how their new clothing brand is going to be the next Prada you wait and see. Yeah...I don't know the specifics, hypothetical clothing line lady, but I'm not holding my breath. The main reason why I'm not getting all excited about that lady's up-and-coming clothing line is the same reason I don't buy lottery tickets. It seems like kind of a crap shoot, and there's not much science or reason telling me I should. That's because what most people call "goals" are actually "dreams". We've all seen the corny Pinterest quote that "a goal is a dream with a deadline" and rolled our eyes, but inside every corny Pinterest quote is a morsel of truth. The reason most people actually have "dreams" when they think they have "goals" is the same basic litmus test that separates the science fiction section from the nonfiction section of the bookstore. Let me explain. When an actual scientist (think physicist, chemist, psychologist, biologist, or some other -ist in a lab coat) tries to prove their latest theory, they all use something called the Scientific Method. This means they have a question/hypothesis, then they actually collect data in a controlled experiment before they can decide whether their hypothesis was true or false. No scientist worth their salt will ever ask you to believe them without data and proof for what they're saying. And they won't believe you unless you have something to back it up either. And that is the scientific mindset I use to decide if I want to believe someone when they tell me they're the next Bill Gates or Elon Musk (or that their kid is going to be). A real goal is constructed using specific goal setting process that guarantees you'll either achieve your goal or know why you didn't (and how to achieve it on your next attempt). Scientific research is done using the Scientific Method. Goal setting is done using the GROW Model. Since the early 1980's, business coaches, consultants, and others in the personal development community have utilized a 4-step process to help their clients set their goals. No one (even the almighty Wikipedia) knows who exactly created it, but it has become widely accepted in multiple fields, from sports to business. 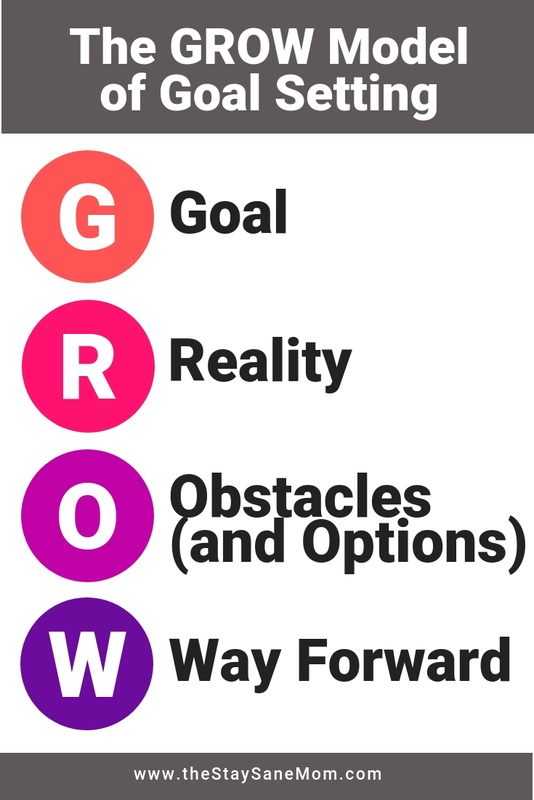 Each of the 4 letters in the GROW model stands for one of the critical steps in the goal-setting process. Stop!!! Before You Read Any More!!! "How will this help me translate an abstract goal into actionable, day-to-day to do items." If a goal is like the top of a mountain and your current state is like the parking lot at the foot of the mountain, the only way to ensure your goal is going to get accomplished is by figuring out the exact path, down to the individual footsteps, you need to take to get from the parking lot to the top. After each section, try to think of how what you just read will translate into action items. The first step of the GROW model is something many people at least attempt to do when they set a goal: figure out what their desired outcome will be. Even the dreamers (remember miss clothing line?) do this in a vague, poorly-defined kind of way. As unrealistic as they sound, "I'm going to be a millionaire before I turn 40" or "my kids are going to go to Harvard" are specific goals. What they lack is a detailed, understandable, and clear definition for what exactly this entails. The most common way to get a clear plan for a goal is by following the SMART Goals framework. This is basically a way to turn an abstract goal into something with a clear definition, time frame (aka deadline), and metrics by which you can measure your performance. If you want to know more about SMART goals, check out my blog post on How to set SMART Goals and it's accompanying freebie worksheet. The next step of the GROW framework is R for Reality. This means that you need to know where you currently stand, in relation to where you want to end up. In business, this is also referred to as performing a Gap Analysis. Basically, you need to know how far you have to travel (and in what direction) in order to accomplish your goal. While most people think a gap analysis is as simplistic as "I want to make $5k a month and right now I'm making $3k a month, so the gap is $2k per month", there's actually a lot more to it than that. A gap analysis includes how far you have until your goal, but it isn't just that. A gap analysis is also all about identifying the resources, skills, assistance, and/or tools you'll need to get you from where you are to where you want to be. In this step of goal setting, you should make sure you identify any training you need, any skills you have to acquire, any support from third parties, or any resources (e.g. start-up capital, time, etc.) you would need to accomplish your goal. Without identifying what you need in order to accomplish a goal, you can't realistically plan for what lies ahead. There's a problem in the way people look at their goals. People think you have a goal and then either accomplish it or you don't. There aren't enough words in the English language to explain to you how wrong that is. The way things really work is you have a goal, then you bounce from failure to failure between 3 and 75 bajillion times, then you finally land on success. The only time you actually land in "catastrophic failure" (which is the psychological term for really, really bad failure from which one doesn't recover or bounce back) is if you either die or stop trying and give up. Every non-catastrophic failure is an important, necessary, and valuable learning experience. Failures are necessary and valuable. 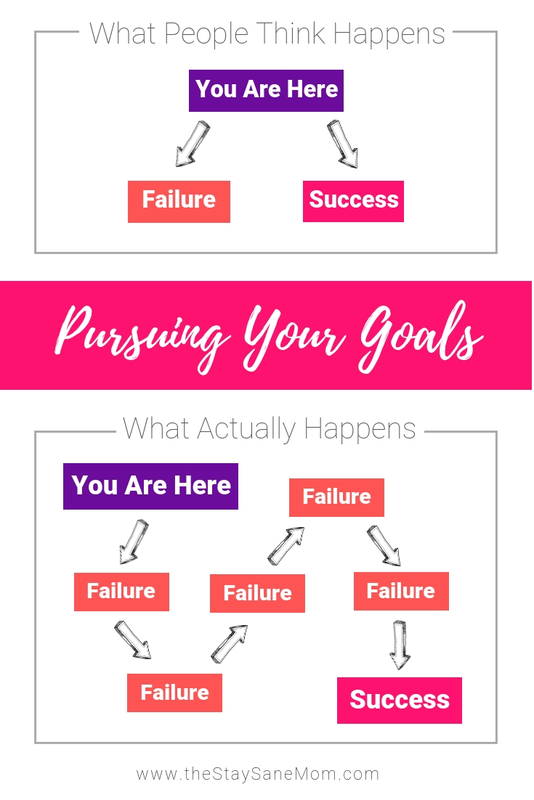 I can (and will, and have) written a billion blog articles on this and I could talk about it until I'm blue in the face, but here's the short version: every time you don't achieve a goal, you miss a milestone, or things don't turn out the way you planned, you learn more than you would have if you had succeeded. Yes, my dears, failure = learning. This is important for the O for Opportunities and Obstacles phase of the GROW model, because this is when you develop contingency plans. What if you don't meet your first milestone? What if you can't raise sufficient startup funds? What if you need a little more education in X, Y, or Z? It's important to plan for these possible roadblocks ahead of time so you can 1) anticipate and avoid them whenever possible and 2) not panic if/when you encounter a roadblock. This part is where the rubber meets the road, so to speak. Finding your way forward means analyzing the SMART goals you set up in Step 1, culling the action items generated by the gap analysis you did in Step 2, looking preemptively for steps you can take to avoid the obstacles identified in Step 3, and putting together an actionable battle plan. This is the most important step because it will take a high-level goal and break it down to the granular level so that, when you sit down at your desk, you begin working on tasks that will bring you closer to your eventual goal. Now, I have two best practices and one present to help you on this step. When you're making your action item list, you're probably going to have a lot of thoughts and tasks swirling around you. Remember the cow scene in Twister? Something like that. When you first sit down to make your action plan, your way forward, don't worry about what order stuff needs to be done, what's most important, or the due dates attached to your tasks. Seriously, sit down (probably using the present you're going to get below) and just spew out every possible task that comes out of your mom-brain in relation to your goal. Make a massive, juicy, chaotic list. If you keep stopping and starting to organize your list it'll temper the flow of ideas, so, for now, just let yourself type away without really worrying about form or format. You'll organize everything once you finish compiling your comprehensive list. Now that you have your massive master list in writing (where it can't escape) you finally get to organize it. Priority: How important is this task in relation to the other things on my list? This is important because you have a limited amount of time to work. (You're a busy lady with a million things to do.) When you sit down to work and only have time to do one thing, you want to make sure that the thing you end up doing is the most important one, the one that's going to do the most to bring you closer to your goals. Category: What type of task is this (e.g. research, writing, content creation, etc.)? This is useful for two reasons. First, giant to-do lists can get overwhelming. Having tasks grouped by category helps your brain make sense of things. Second, if you ever batch tasks, being able to see all the tasks that belong to a specific category (e.g. writing, networking, or social media promotion) makes batching so much easier! Due Date: If any tasks have to be done by a specific date, this is when you want to mark it down. You can also include dates you hope to use as milestones, but remember to indicate whether a due date is "set in stone" or "I hope to be done by then". GOAL: You set a goal in Step 1, making sure it was concrete and SMART. REALITY: In Step 2 you analyzed what resources would be needed to get you from where you are to where you want to go. OBSTACLES: Step 3 had you think about potential obstacles and how to overcome them. WAY FORWARD: In Step 4 you translated your high-level goal into specific action items. One of the biggest challenges in goal setting is in staying organized. It's really hard to keep everything listed out in the detail you need (what we described in step 4) when things change all the time, have to be reorganized, reordered, or otherwise evolve. Your present from me is the exact spreadsheet I use to translate my goals into action items. This action plan also then serves as my personal to do list whenever I sit down at my desk to work. It's a massively helpful document that I wanted to share because it took me forever to create and even longer to perfect. Then get your free copy below! P.S. Don't forget to let me know how it works for you in the comments.